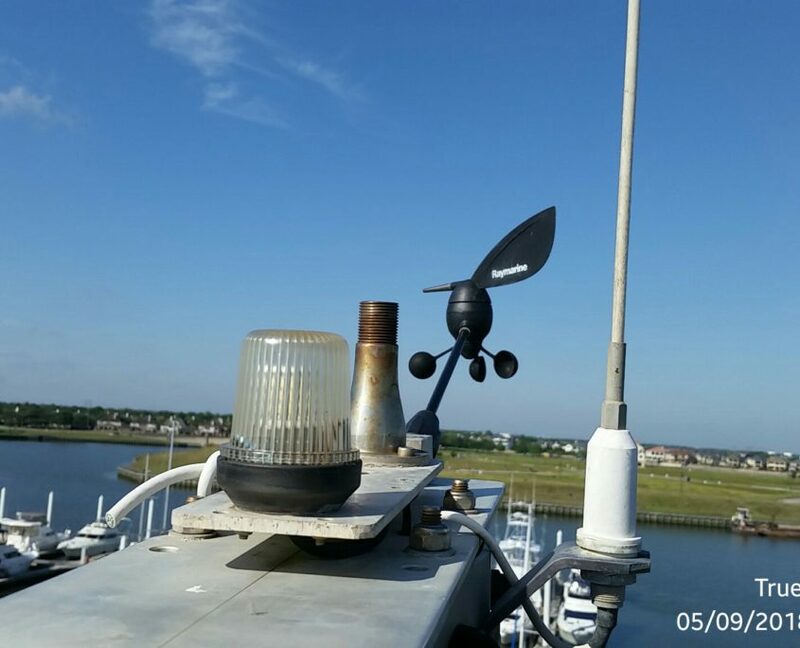 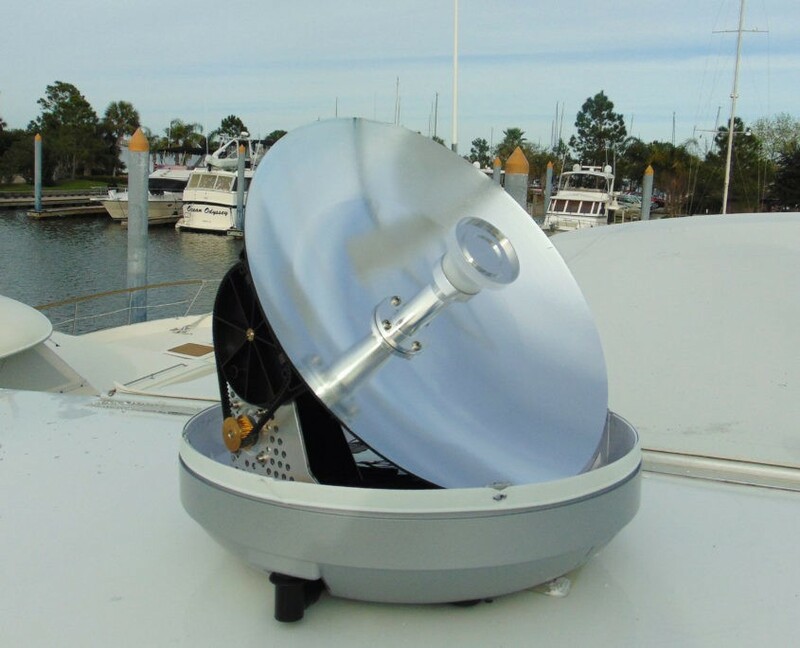 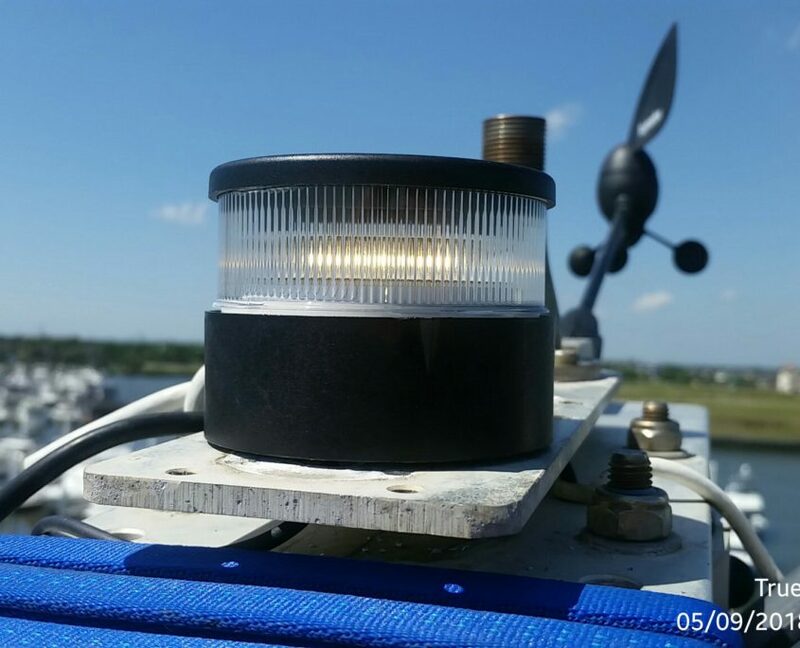 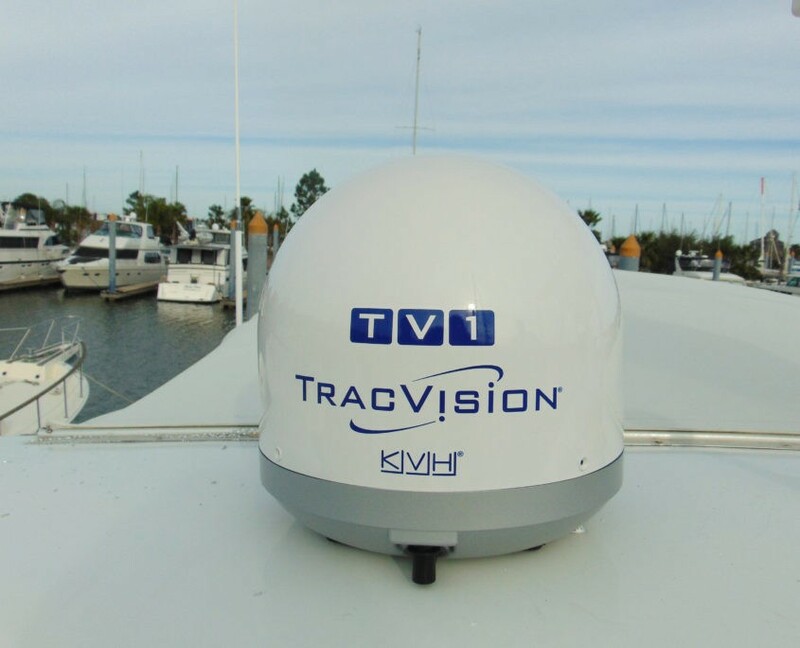 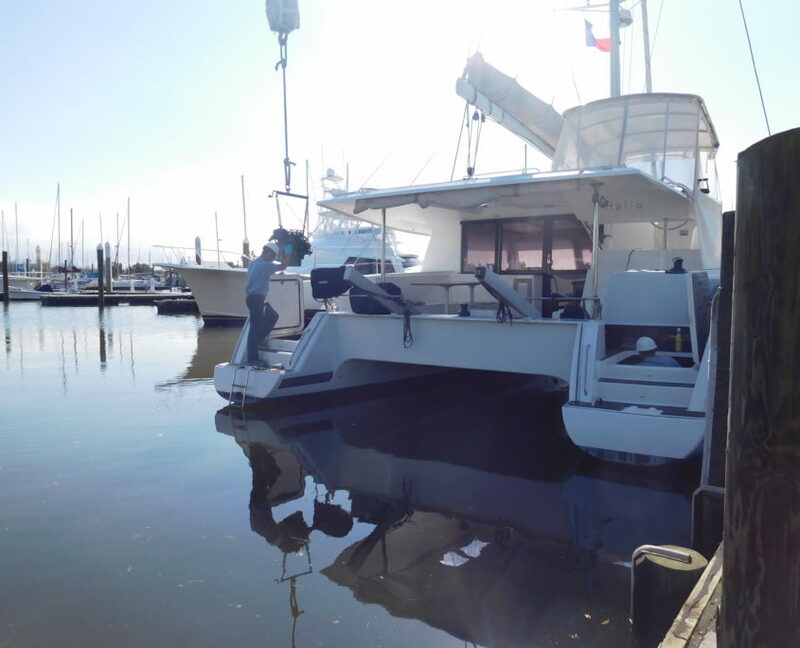 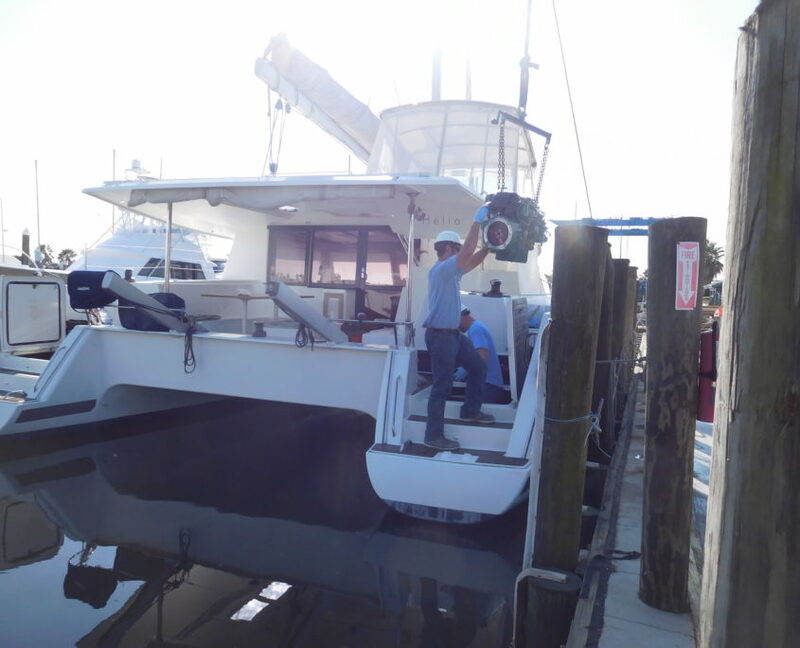 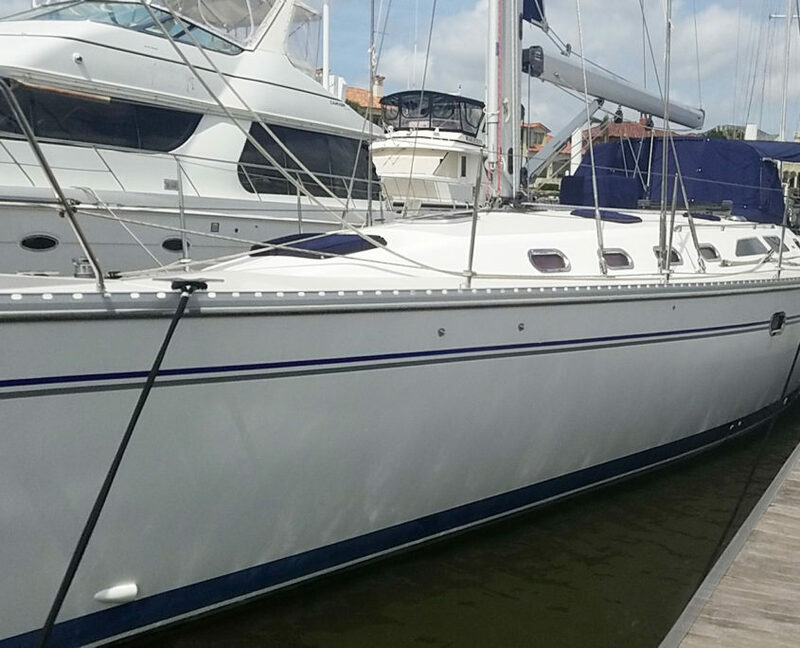 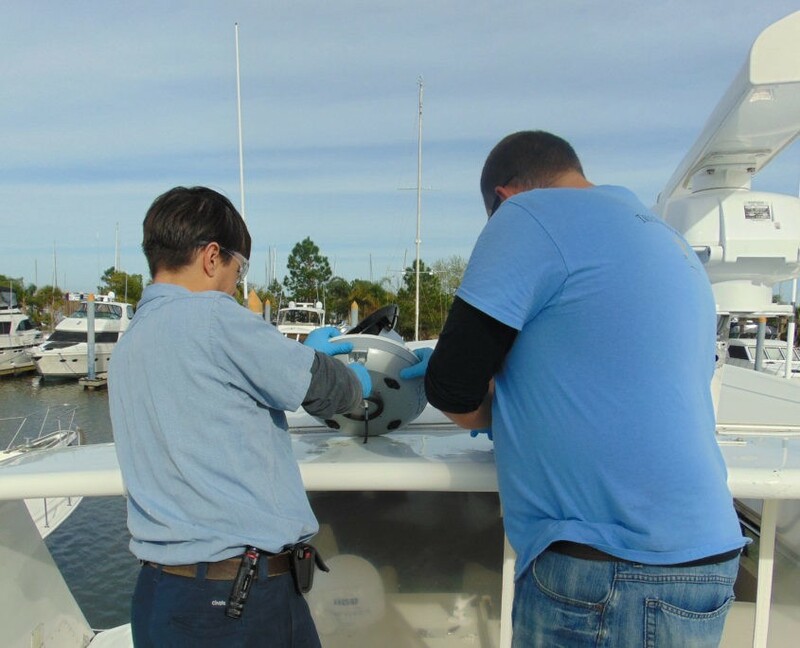 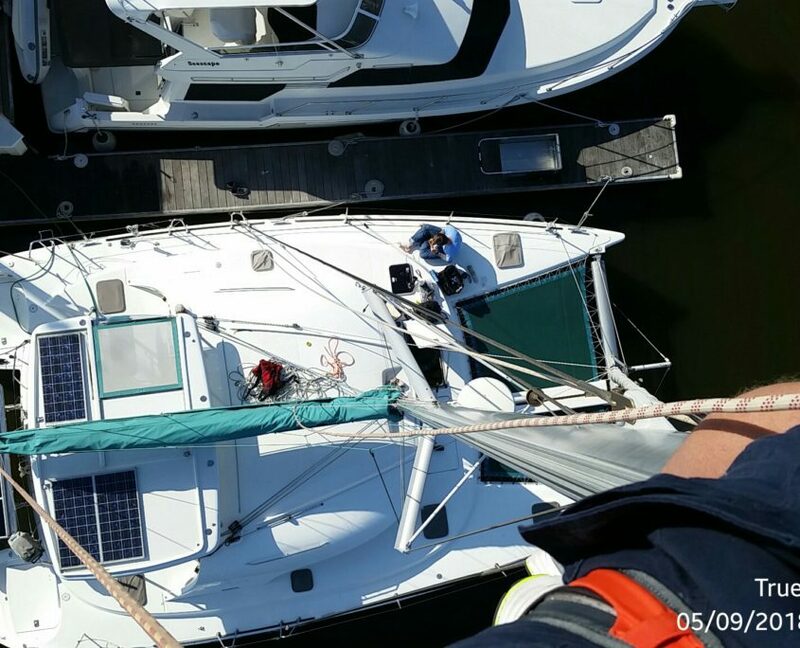 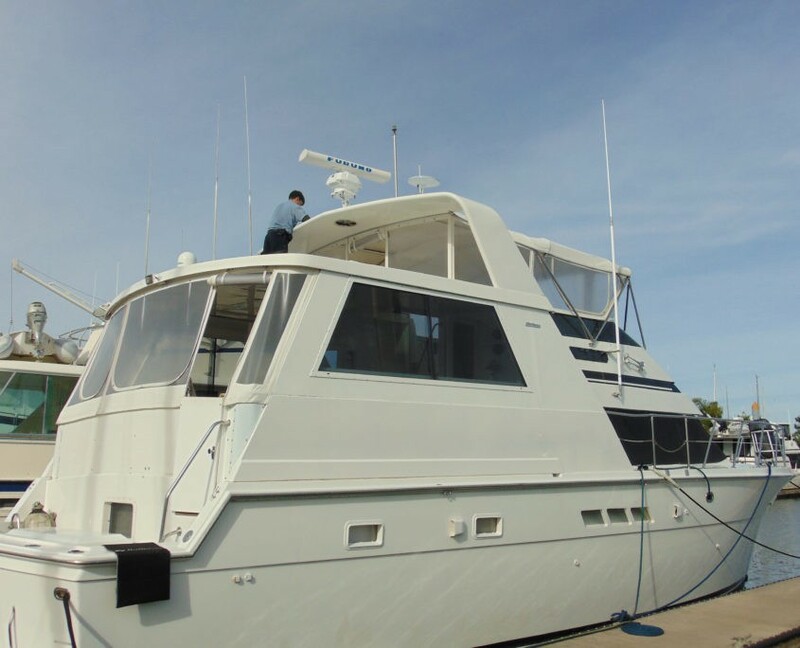 See pictures below from a recent installation of a KVH satellite receiver system using Dish Network aboard this Hatteras to supply cable service to four TVs on board! 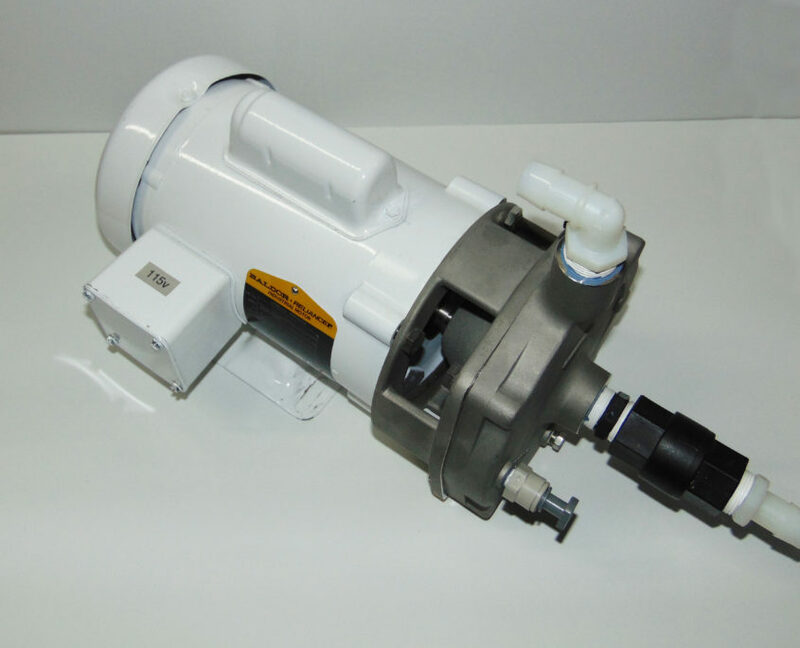 Contact our Service department if you’d like more information. 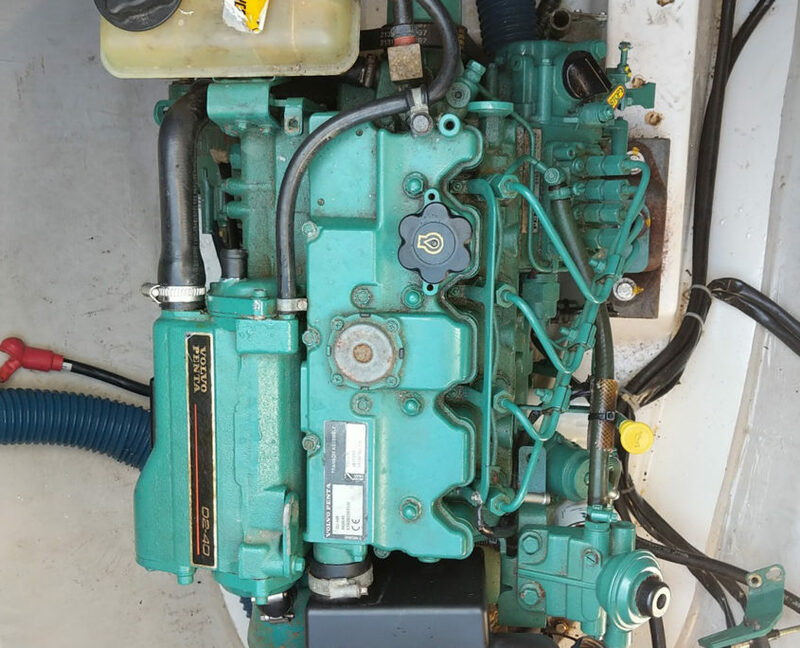 As a Volvo Penta diesel engine dealer, we are authorized to perform warranty campaign work directly for the manufacturer. 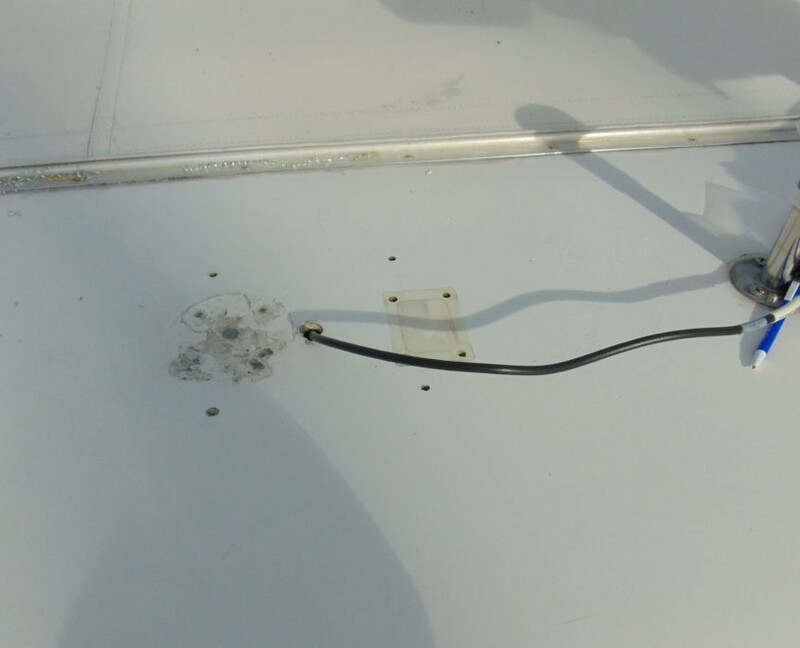 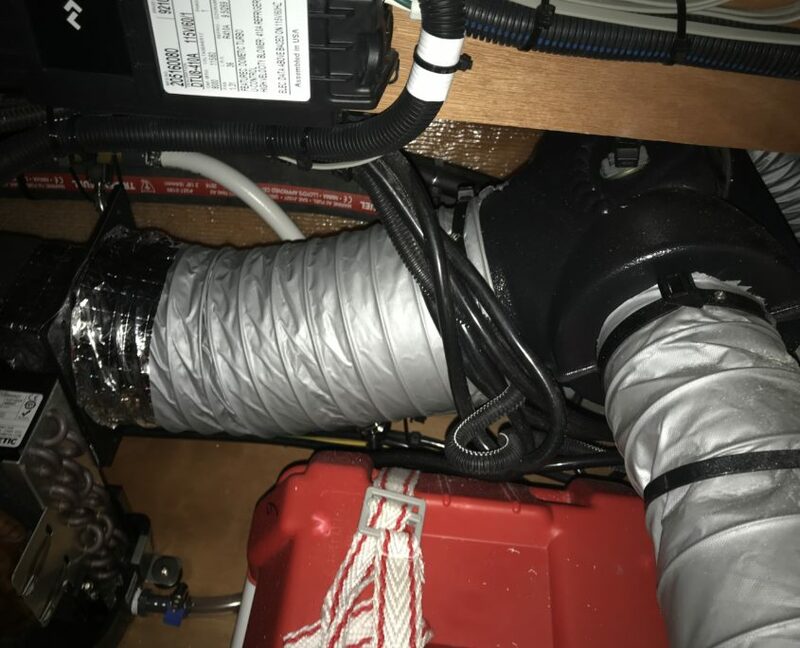 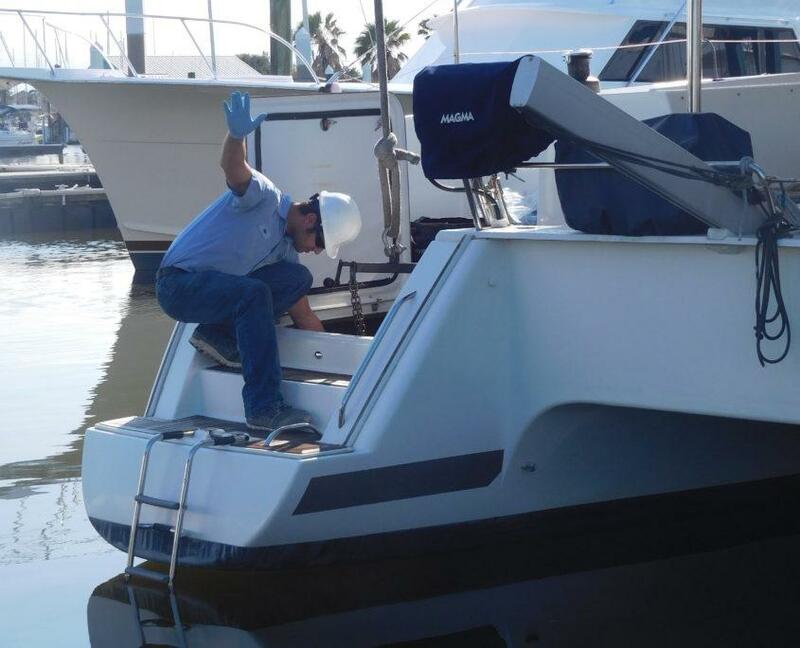 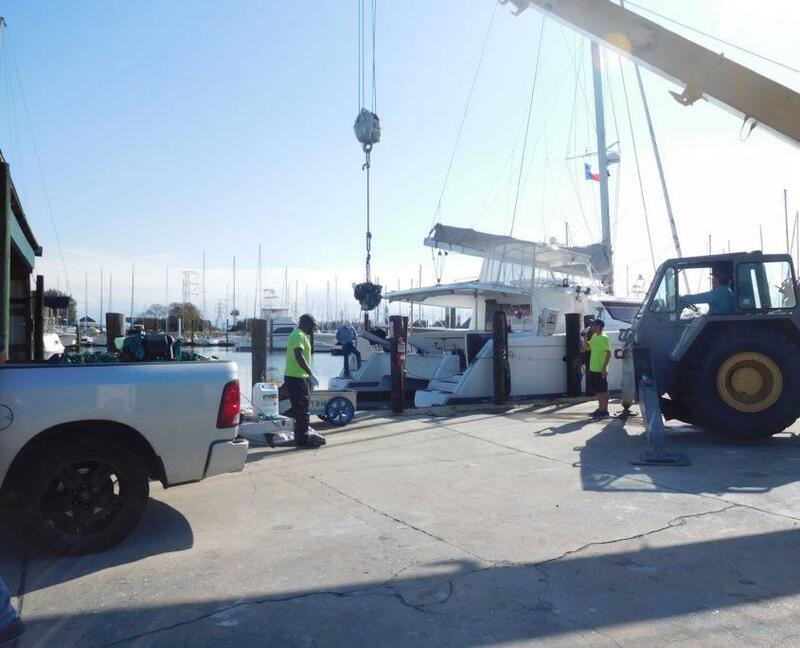 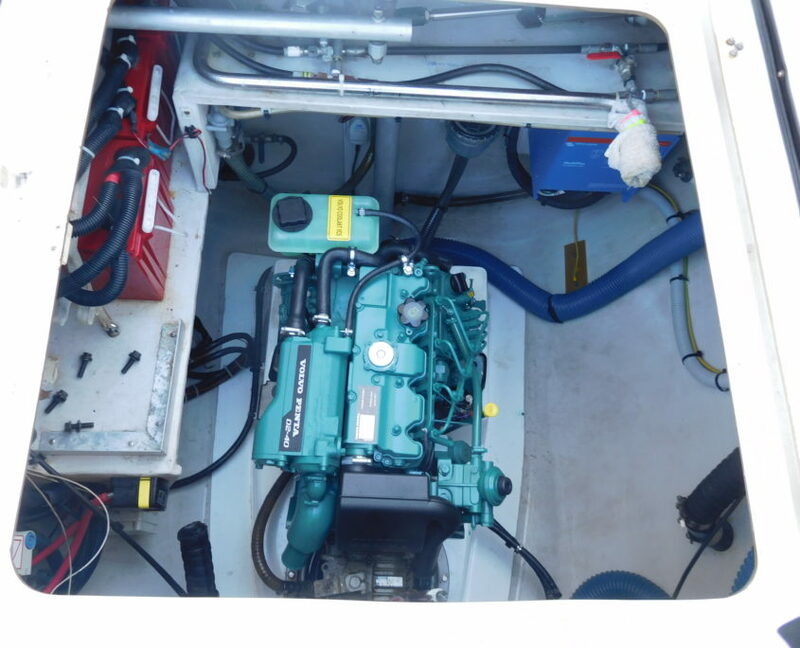 In this case, the engines installed in this six year old Catamaran were exchanged for new assemblies under a D1-30 / D2-40 emissions recall campaign. 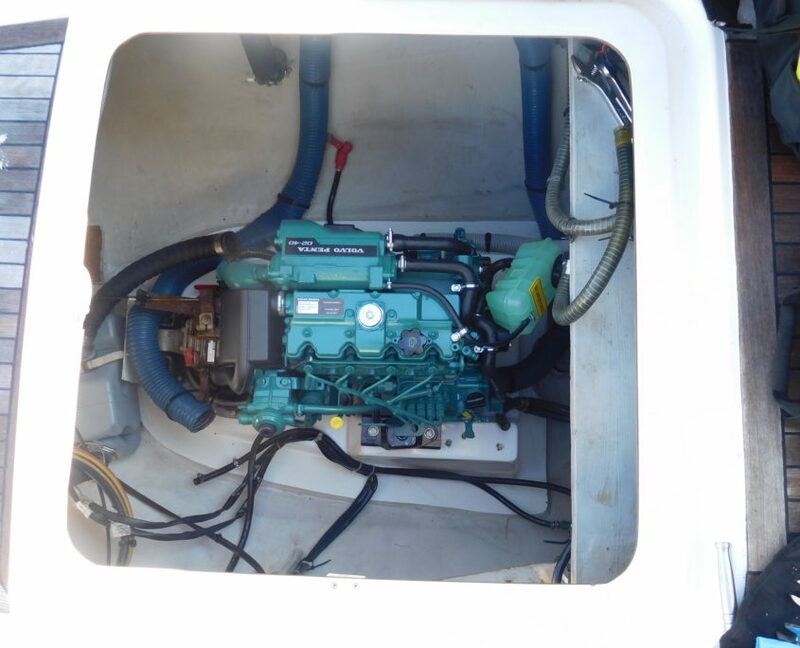 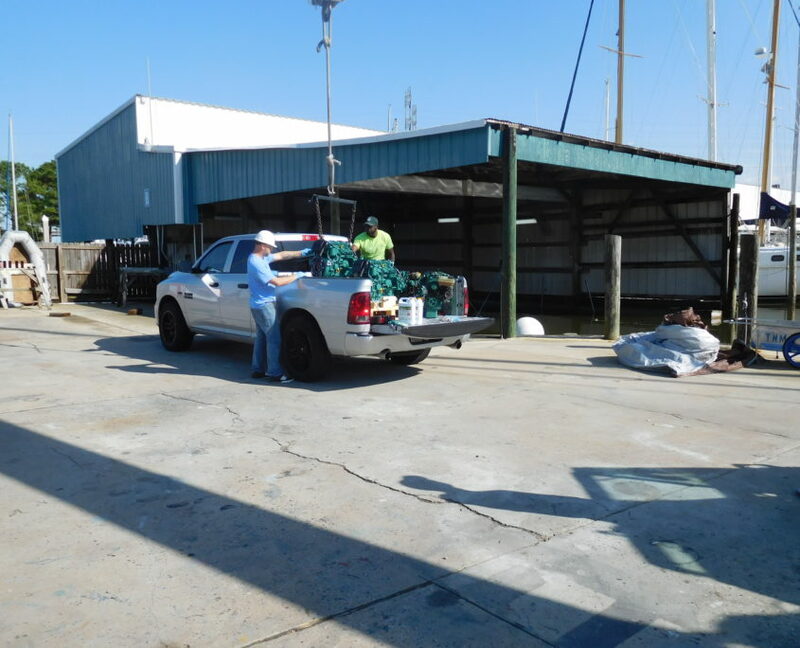 Even though the engines were almost six years old, they were removed and replaced at no cost to the vessel owner. 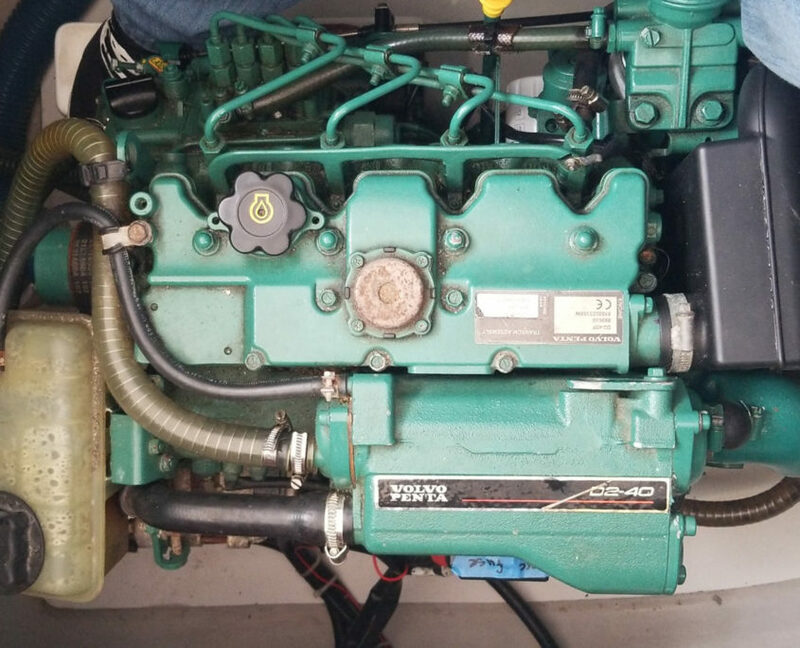 If you own one of these model Volvo Penta diesels, please contact our Service Department to see if your serial numbers are covered as part of this campaign. 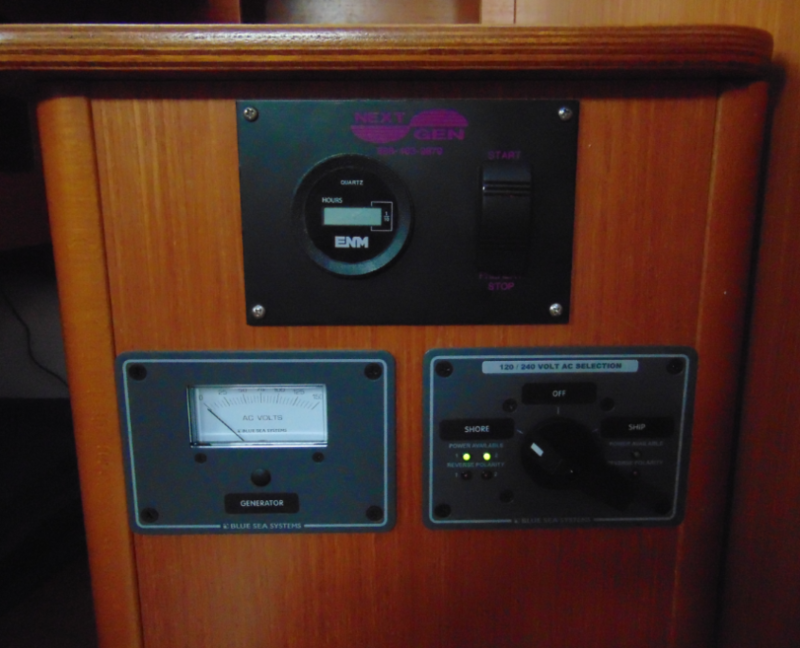 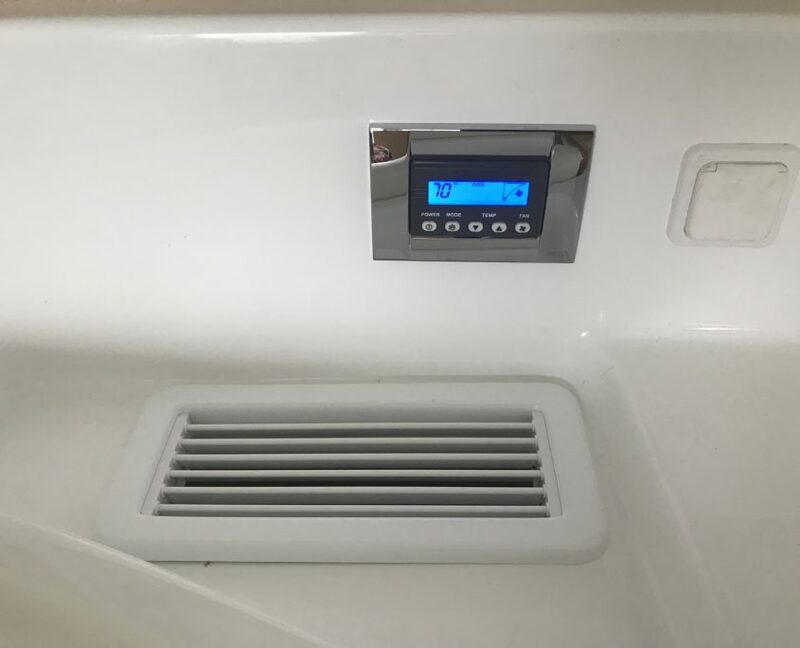 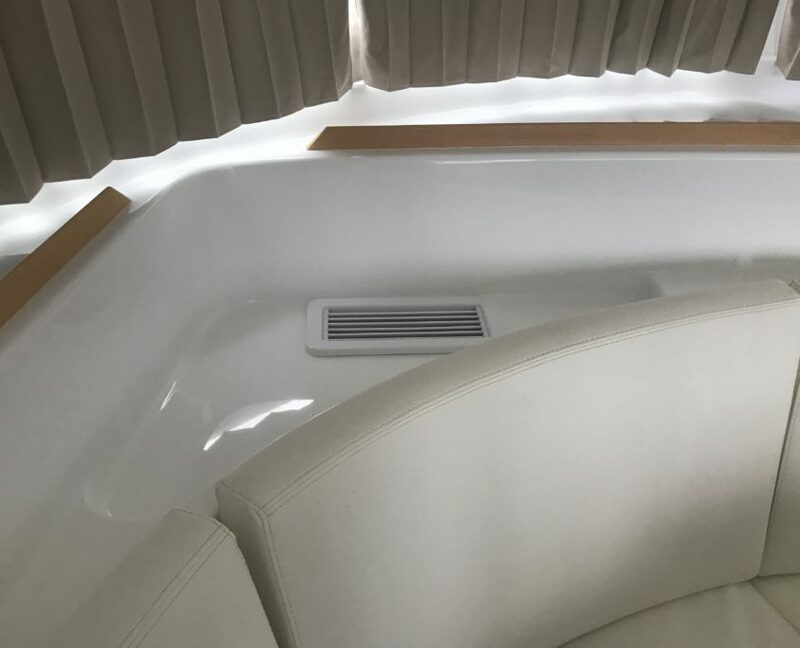 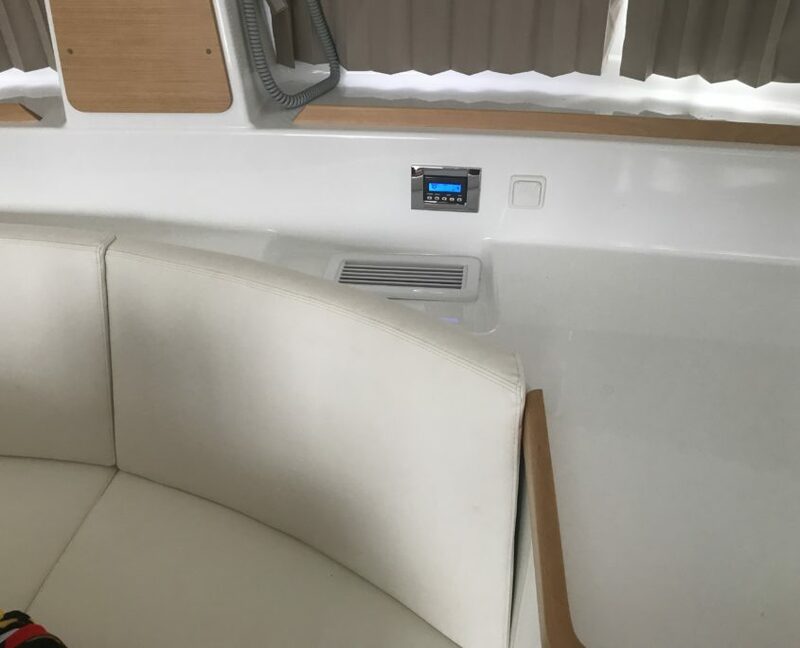 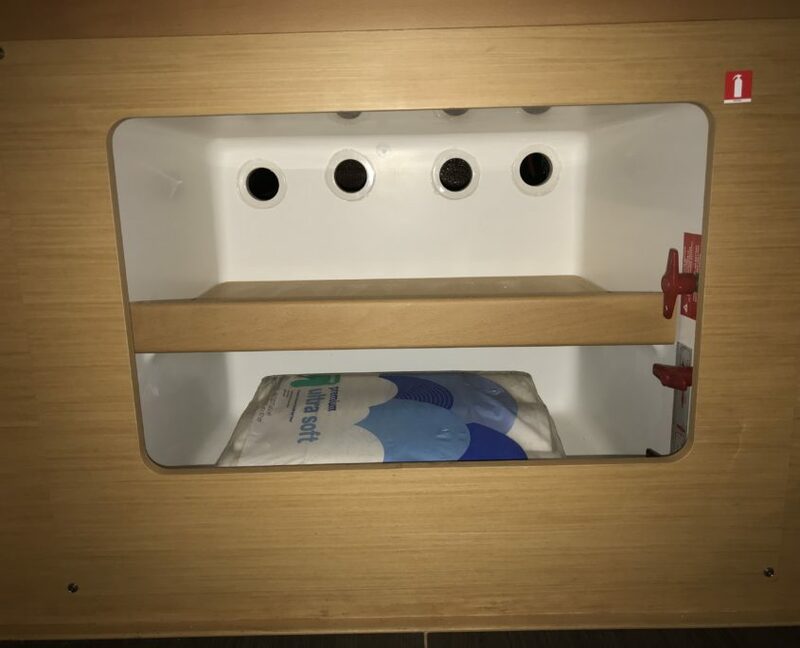 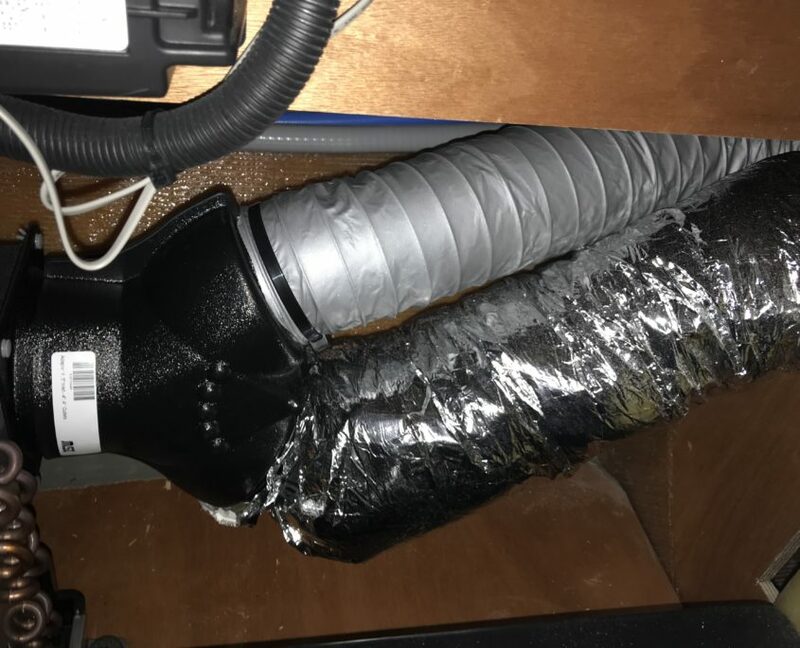 Air conditioning and supporting systems installed aboard a new 2018 Lagoon 380. 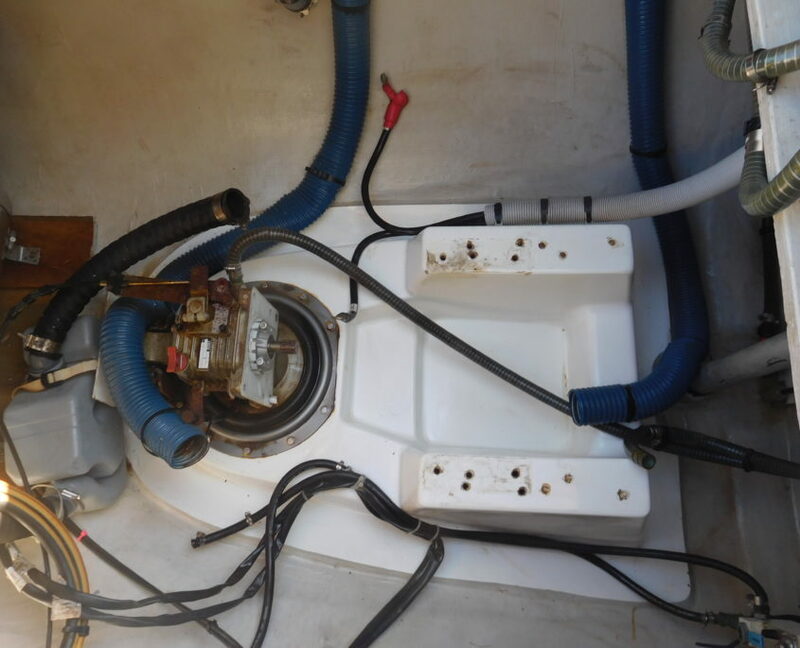 This is a new boat that came from the factory without air conditioning, or any supporting systems. 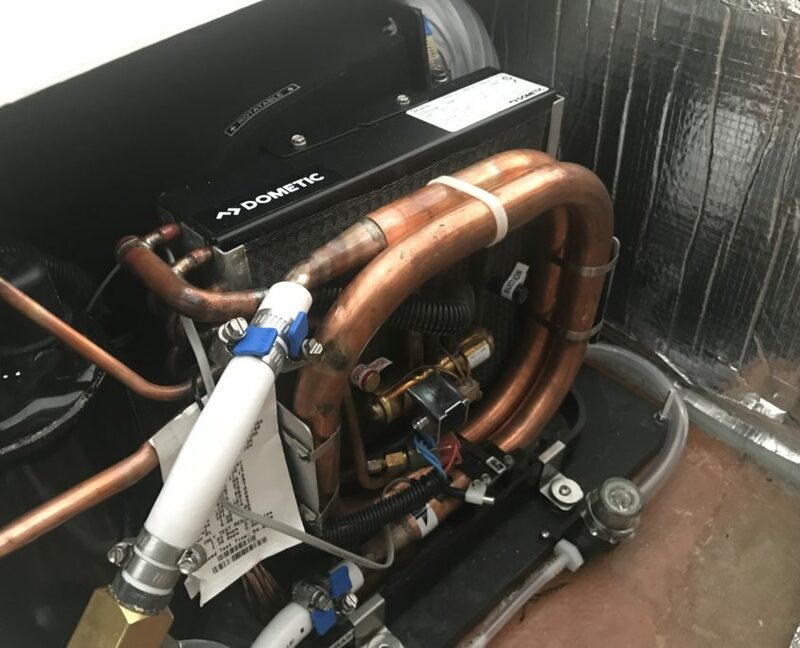 We installed 3 Dometic self-contained air conditioning units with reverse cycle heat. 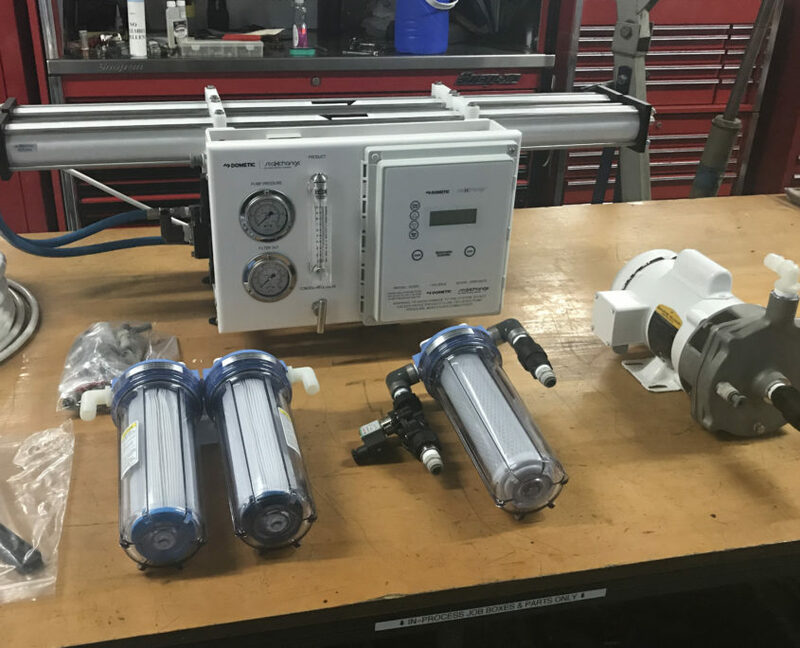 Due to space constraints, a DTU16 and two DTU8’s were spec’d. 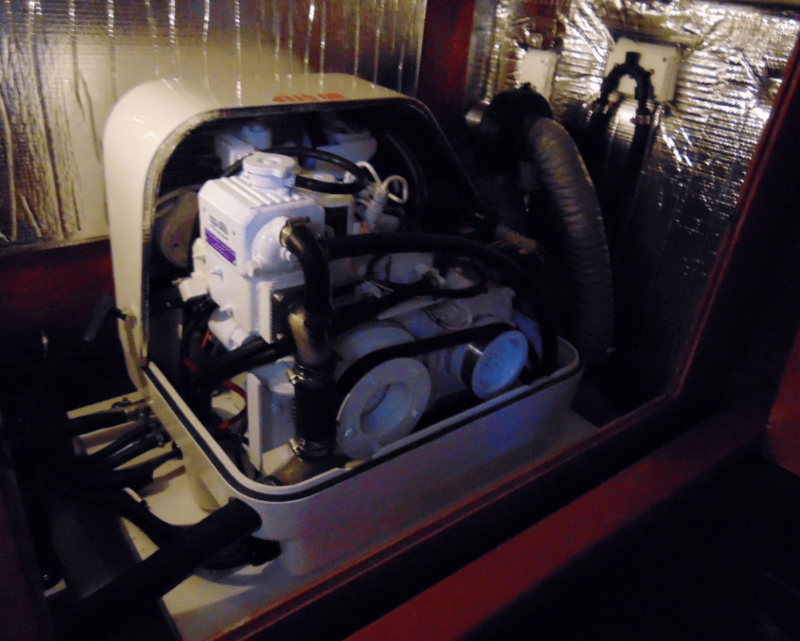 The 16k BTU unit services the salon area, and the two 8k BTU units service cabins in each hull, with additional ducting to heads and other cabin spaces. 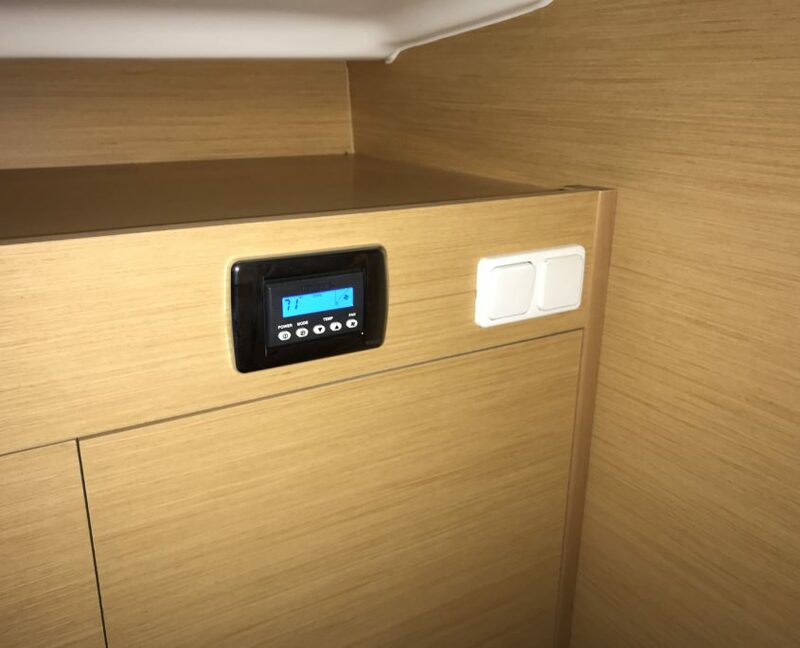 Optional Dometic QHT digital displays and return/supply air grills were used to match other Lagoon factory installations. 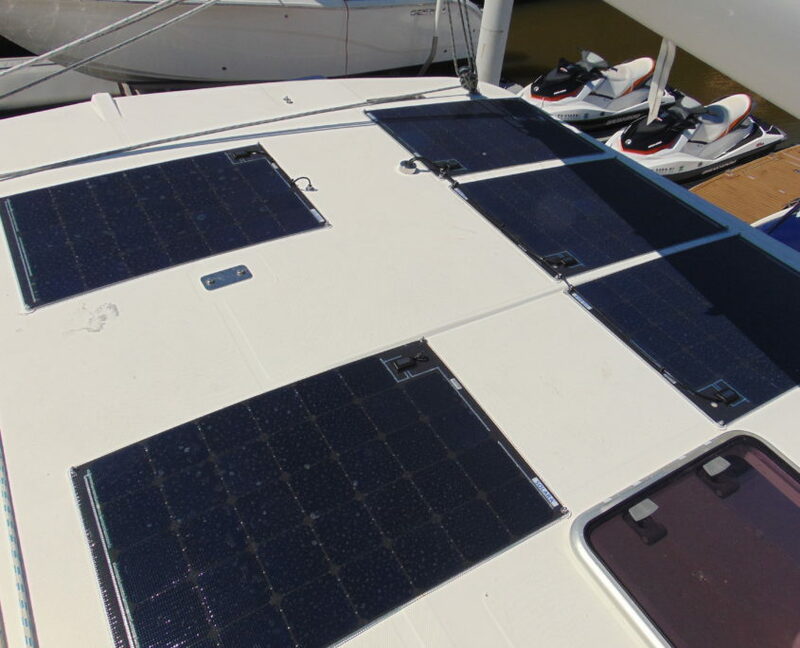 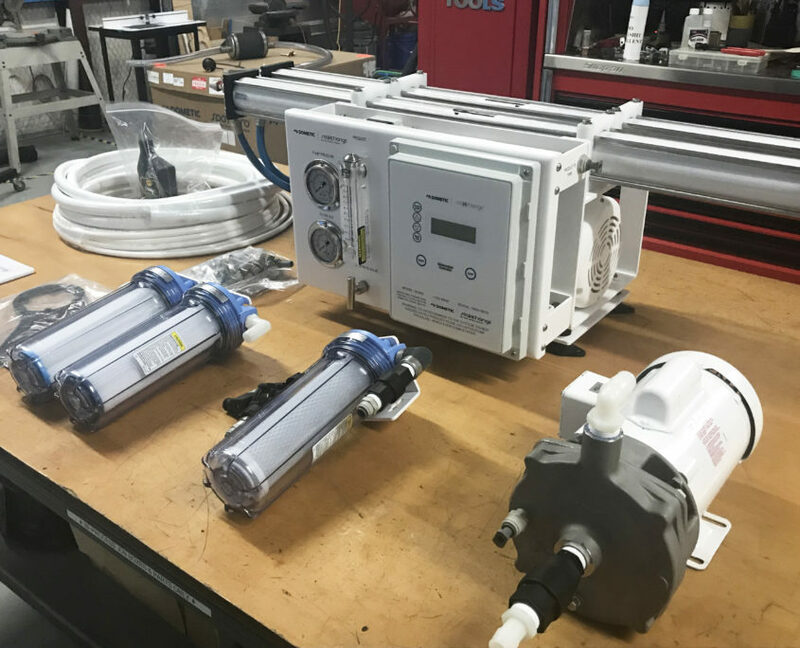 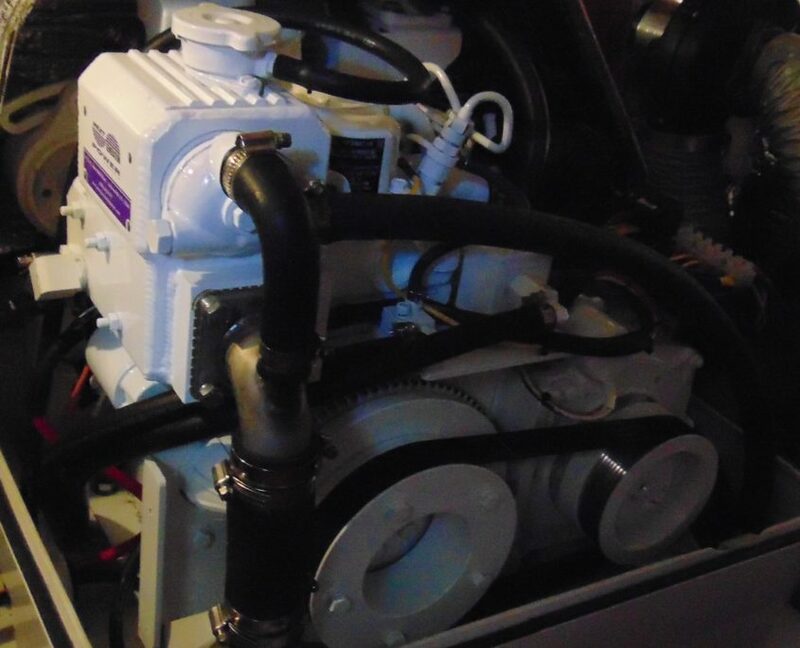 The system employs one 1000 gph pump in one hull to service two units, and another 500 gph pump in the other hull to service the third unit. 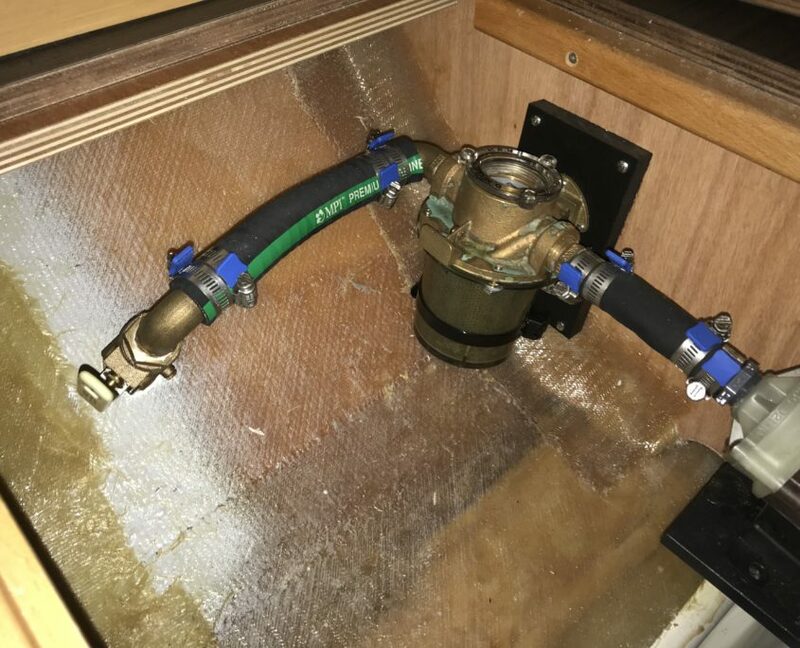 Large Groco sea water strainers were installed to minimize strainer servicing in the summer months. 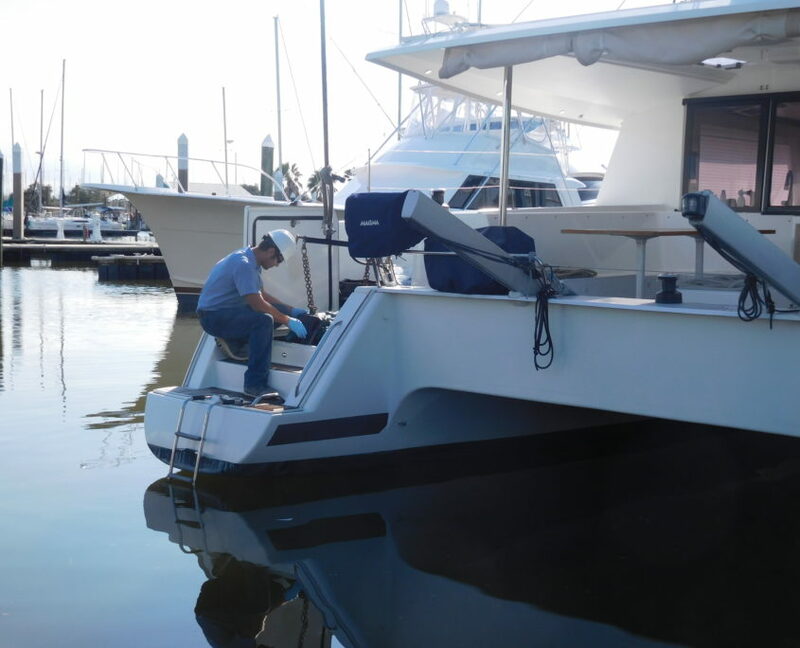 High quality Groco thru-hulls, ball valves, and full-flow hose barbs were also installed. 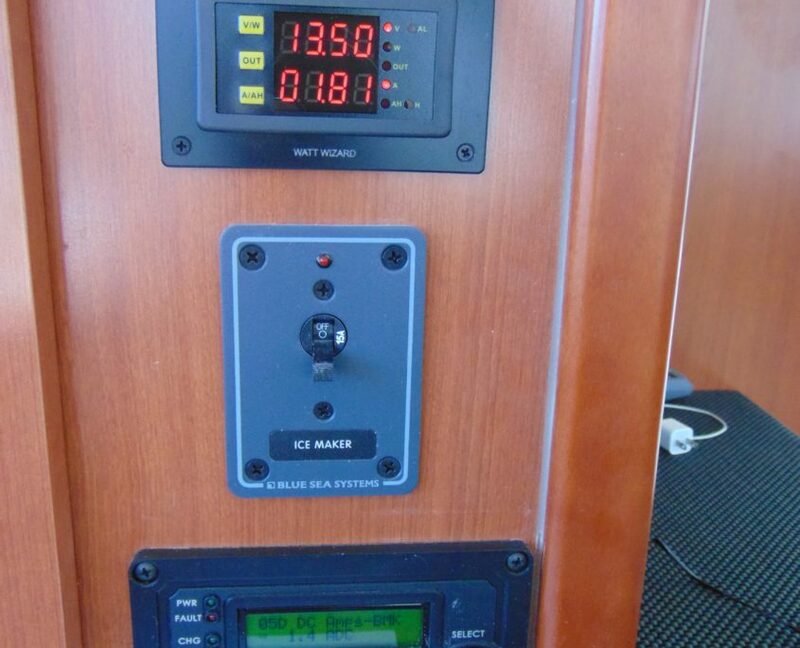 An additional 30 amp 125 volt shore power circuit was installed to handle the additional electrical load. 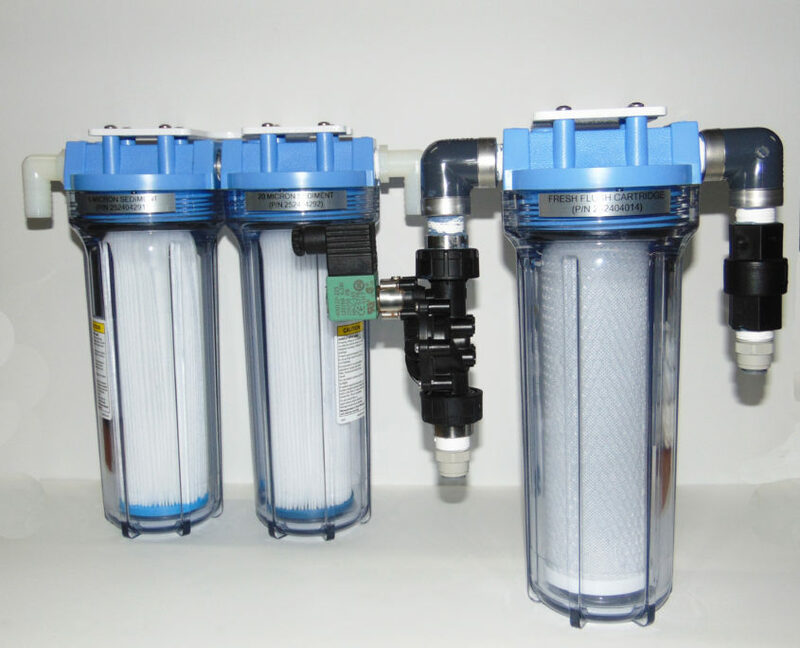 Venturi condensate removal systems were used on all three units. 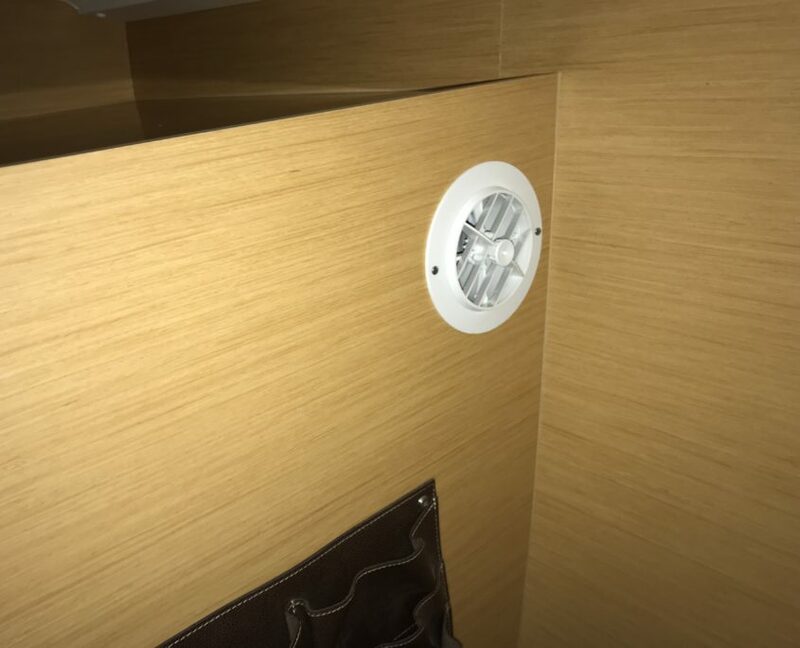 Additional sound insulation and vibration isolation was also installed. 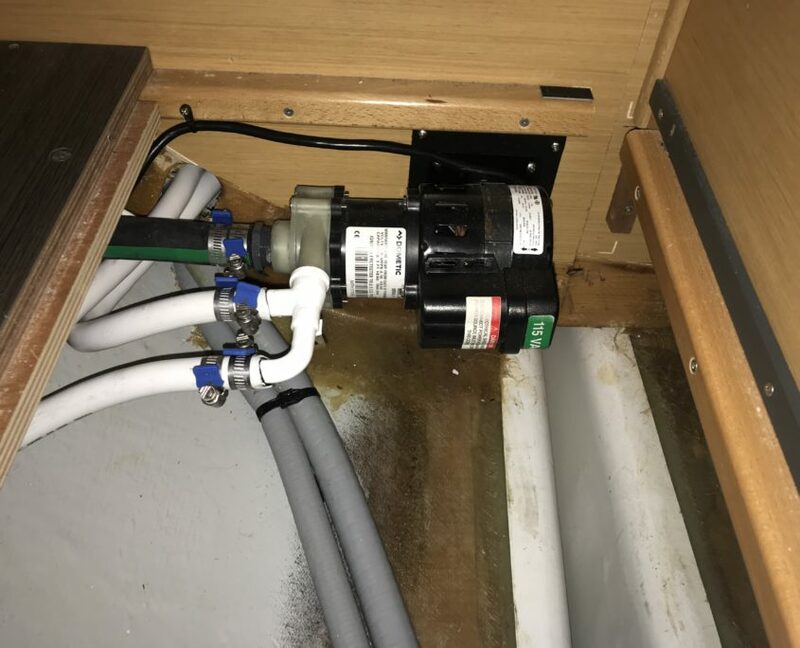 The system doesn’t struggle to cool the boat, even in the Texas Heat! 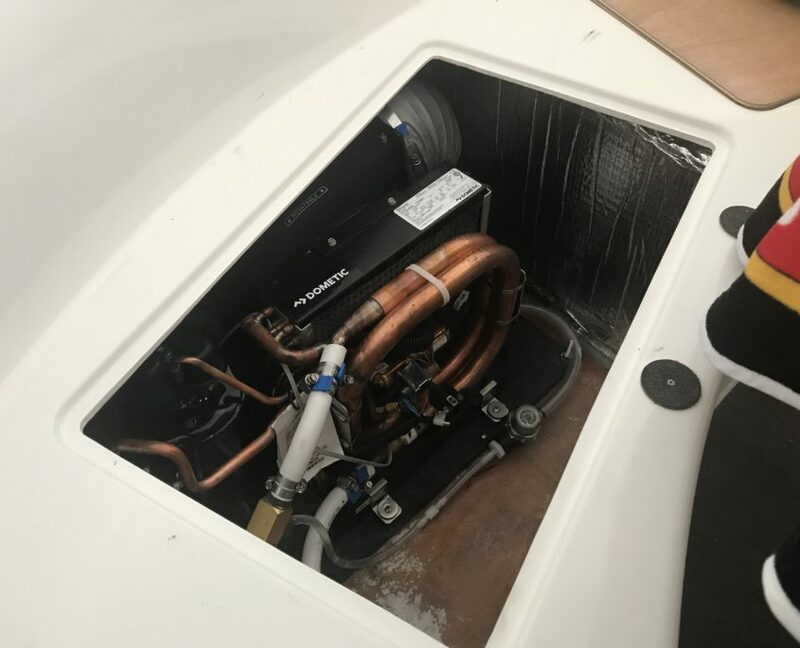 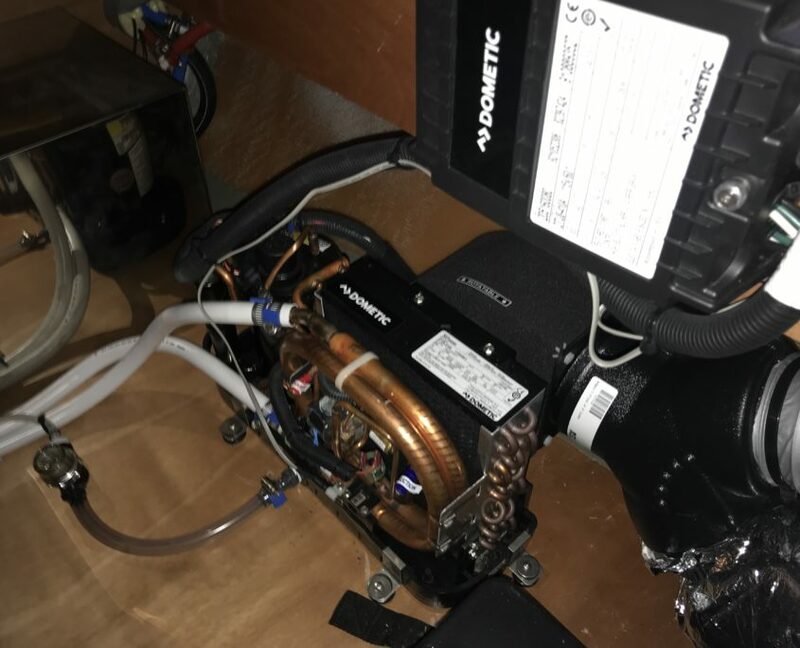 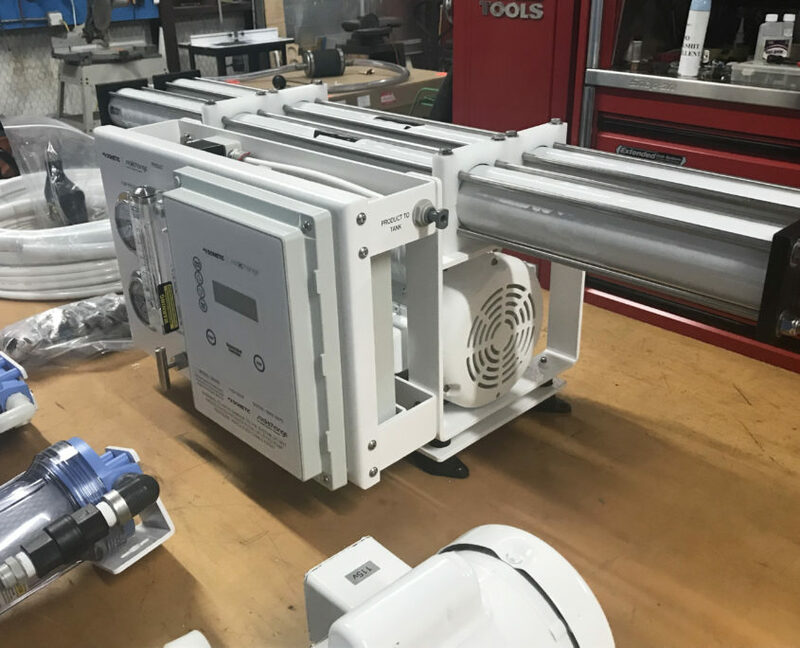 New Dometic SeaXchange SE 800z Watermaker and all supporting systems are in the process of being installed onboard a Catalina 470. 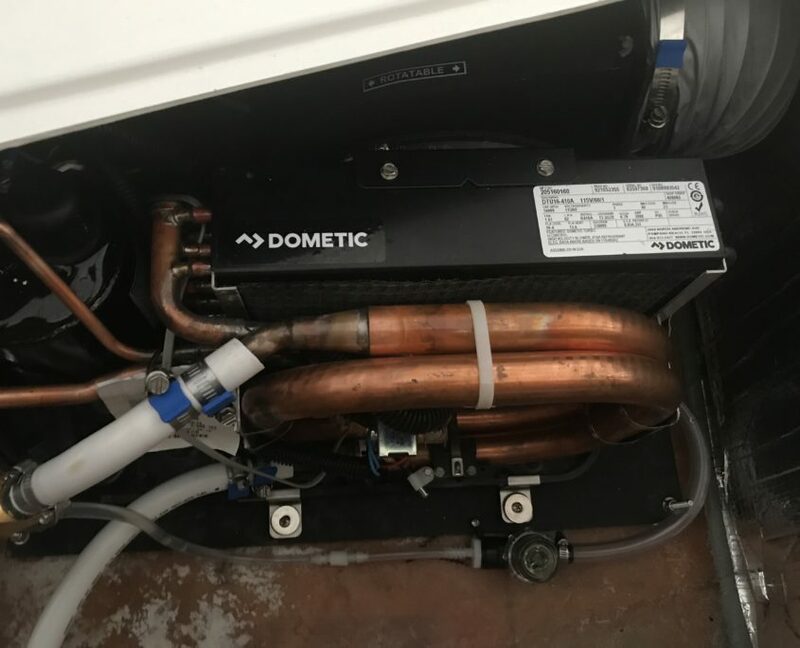 Dometic SeaXchange SE Watermakers provide recreational boaters with the luxury of creating ample potable water while cruising on the ocean. 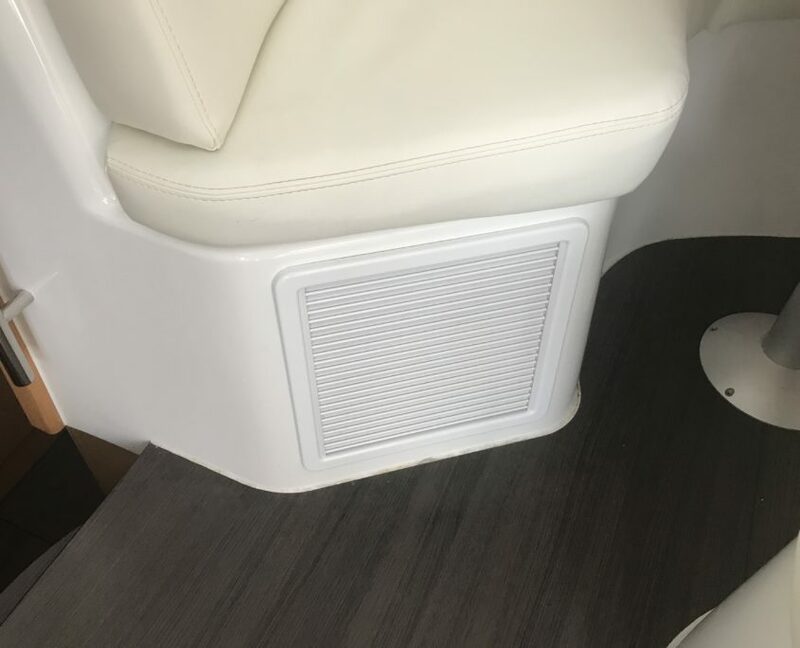 Check back for more pictures once the installation is complete! 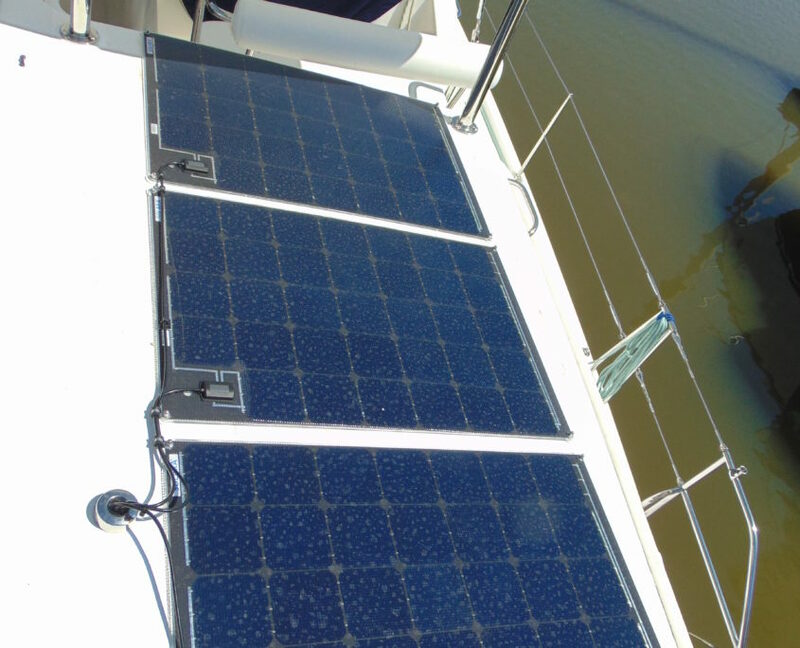 Replaced existing solar panels with 4 new solar panels, along with new charging equipment and charge controllers.